“Bolshevism,” the chief of the Brown Shirts, the Fascists of Germany, continued, gazing at me balefully, “is our greatest menace. Kill Bolshevism in Germany and you restore 70 million people to power. France owes her strength not to her armies but to the forces of Bolshevism and dissension in our midst. When Adolf Hitler announced this programme, the advent of the Third Empire [Reich] which he proclaims seemed still at the end of the rainbow. Then came election after election. Each time the power of Hitler grew. While unable to dislodge Hindenburg from the presidency, Hitler today heads the largest party in Germany. Unless Hindenburg assumes dictatorial measures, or some unexpected development completely upsets all present calculations, Hitler’s party will organise the Reichstag and dominate the government. Hitler’s fight was not against Hindenburg but against Chancellor Bruening. It is doubtful if Bruening’s successor can sustain himself without the support of the National Socialists. Many who voted for Hindenburg were at heart with Hitler, but some deep-rooted sense of loyalty impelled them nevertheless to cast their vote for the old field marshal. Unless overnight a new leader arises, there is no one in Germany, with the exception of Hindenburg, who could defeat Hitler – and Hindenburg is 85! Time and the recalcitrance of the French fight for Hitler, unless some blunder on his own part, or dissension within the ranks of the party, deprives him of his opportunity to play the part of Germany’s Mussolini. I met Hitler not in his headquarters, the Brown House in Munich, but in a private home – the dwelling of a former admiral of the German Navy. We discussed the fate of Germany over teacups. Hitler himself is not a purely Germanic type. His dark hair betrays some alpine ancestor. For years he refused to be photographed. That was part of his strategy – to be known only to his friends so that, in the hour of crisis, he could appear here, there, and everywhere without detection. Today he could no longer pass unrecognised through the obscurest hamlet in Germany. His appearance contrasts strangely with the aggressiveness of his opinions. No milder mannered reformer ever scuttled ship of state or cut political throat. “We believe in a healthy mind in a healthy body. The body politic must be sound if the soul is to be healthy. Moral and physical health are synonymous.” “Mussolini,” I interjected, “said the same to me.” Hitler beamed. “Economic imperialism, like military imperialism, depends upon power. There can be no world trade on a large scale without world power. Our people have not learned to think in terms of world power and world trade. However, Germany cannot extend commercially or territorially until she regains what she has lost and until she finds herself. “We are in the position of a man whose house has been burned down. He must have a roof over his head before he can indulge in more ambitious plans. We had succeeded in creating an emergency shelter that keeps out the rain. We were not prepared for hailstones. However, misfortunes hailed down upon us. Germany has been living in a veritable blizzard of national, moral, and economic catastrophes. Hitler evaded a direct reply to this question. He evaded it again recently  when Liberty [magazine] asked him to reply to Trotsky’s statement that his assumption of power in Germany would involve a life-and-death struggle between Europe, led by Germany, and Soviet Russia. “It does not matter,” Hitler, thoroughly aroused, retorted, “how many square miles the enemy may occupy if the national spirit is aroused. Ten million free Germans, ready to perish so that their country may live, are more potent than 50 million whose will power is paralysed and whose race consciousness is infected by aliens. “We want a greater Germany uniting all German tribes. But our salvation can start in the smallest corner. Even if we had only 10 acres of land and were determined to defend them with our lives, the 10 acres would become the focus of regeneration. Our workers have two souls: one is German, the other is Marxian. We must arouse the German soul. We must uproot the canker of Marxism. Marxism and Germanism are antitheses. 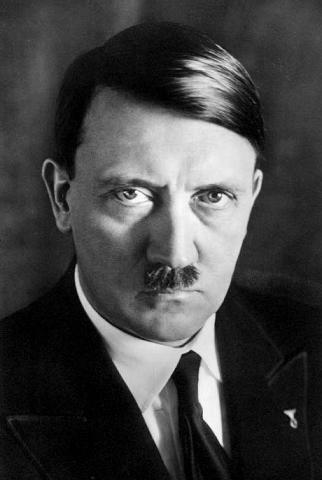 The cords on Hitler’s forehead stood out threateningly. His voice filled the room. There was a noise at the door. His followers, who always remain within call, like a bodyguard, reminded the leader of his duty to address a meeting.